The US House voted this evening on the Ryan- Murray budget compromise passing it by a vote of 332-94-7. Conservatives across the country lit up the phones and email servers with urges to oppose the budget deal. Here in Arizona, the calls made an impact on our House members. Be sure to contact your Republican congressman and thank him for voting NO against this budget which raised spending with no promise of future cuts. WASHINGTON – Today, Rep. Ron Barber voted to keep the Internal Revenue Service (IRS) in charge of implementing ObamaCare, despite the numerous scandals that have severely hurt the agency’s credibility. The IRS has betrayed the trust of the American people, yet Democrats like Ron Barber want it to have a “dominant role” in our healthcare. They can’t even be trusted to use your tax dollars wisely, why should they be trusted with your healthcare? 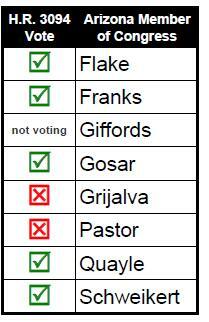 Ron Barber Votes Against Preventing The IRS From Implementing ObamaCare. WASHINGTON, D.C., November 30, 2011 — The National Federation of Independent Business (NFIB) released the following statement by Senior Vice President for Federal Public Policy Susan Eckerly regarding today’s vote on H.R. 3094, the Workforce Democracy and Fairness Act. The legislation was proposed in response to the National Labor Relation Board’s (NLRB) recent proposal on “ambush” elections and its decision in Specialty Healthcare to allow micro-unions, and is strongly supported by the NFIB. “The NLRB is at it again. In an attempt to circumvent Congress—after it prevented the passage of card check legislation—the NLRB proposed the ‘ambush election rule,’ condensing the time period in which employers and employees have to prepare for a union election, so undermining the rights of both. And in its latest effort to blunt employer rights, the Board ruled in favor of so-called micro-unions, allowing unions to organize mini-bargaining units throughout a business. Unfortunately, the NLRB fails to realize that its pro-union actions will only create more uncertainty for small-business owners at a time when the country needs them to be creating more jobs. NFIB is the nation’s leading small-business advocacy organization, representing 350,000 small businesses around the country. NFIB is the nation’s leading small business association, with offices in Washington, D.C., and all 50 state capitals. Founded in 1943 as a nonprofit, nonpartisan organization, NFIB gives small and independent business owners a voice in shaping the public policy issues that affect their business. NFIB’s powerful network of grassroots activists send their views directly to state and federal lawmakers through our unique member-only ballot, thus playing a critical role in supporting America’s free enterprise system. NFIB’s mission is to promote and protect the right of our members to own, operate and grow their businesses. More information is available online at www.NFIB.com/newsroom. We did an overview of the session from a Pachyderm Coalition rating perspective. Of legislation that passed the legislature, we supported 129 bills and opposed 16 for a percentage of 89%. When these were adjusted by the weights assigned to the bills, the percentage was slightly higher at 93% which meant that we were more successful, on average, with the bills that were more important to us. Also, there were 38 bills we opposed that did not pass in the legislature. The average scores of the legislators were good this session which reflected passing a good budget and probably also increased party discipline due to having larger majorities. The performance of Senators compared to Representatives, overall, was very comparable. This year, we decided that it was important to add one more important player in the legislative process to our ratings: the Governor, Jan Brewer. We calculated her score after the session ended. After the governor decided which bills sent to her desk would become law and which she would veto, we applied our scoring to the Governor’s actions. For all bills sent by the legislature to the Governor, we considered signing the bill or allowing it to become law without signing would be considered as a YES vote while a veto would be considered a NO vote. The Governor either signed or vetoed all bills from the Regular Session – she did not allow a bill to become law without her signature. Signing a bill we positively weighted would increase her score and vetoing it would reduce her score. For negatively weighted bills, signing decreased her score and vetoing increased her score. As with the legislators, she was rated only on the actions she could take in the legislative process by a specific, recordable action. For the legislators, it is votes. For the Governor, it is allowing bills sent to her to become law or to veto them. Of the bills we were tracking, the Governor’s vetoed 20 bills we supported and 1 bill we opposed. She signed 109 bills we supported and 15 bills we opposed. 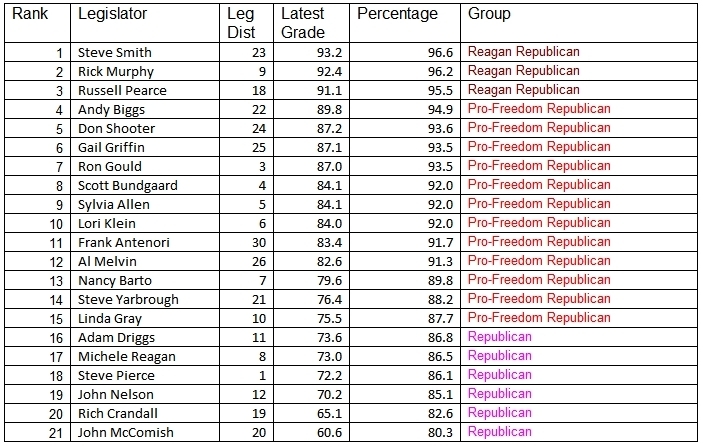 Governor Jan Brewer’s Pachyderm score is 56.7 which we label as Republican. 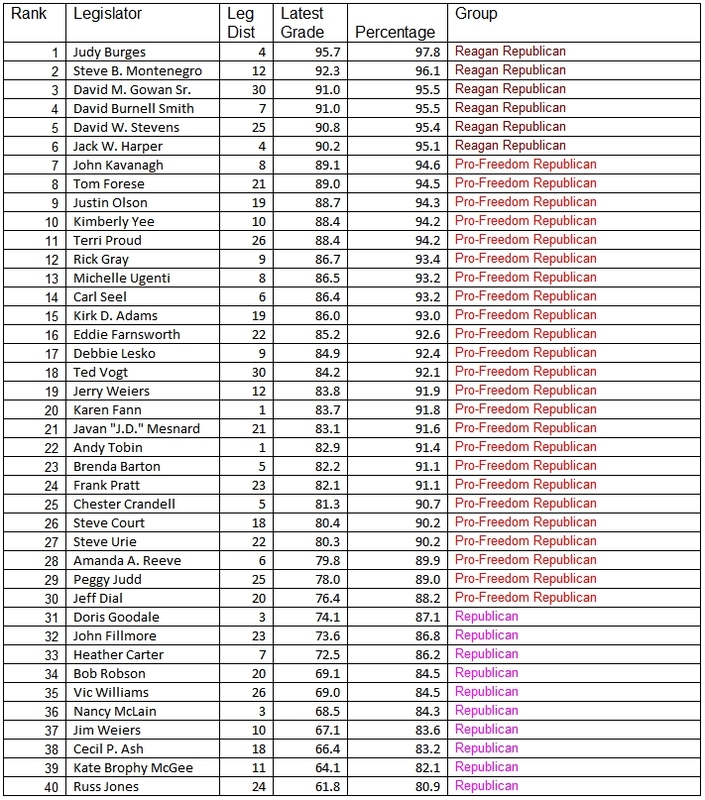 This is substantially below the average scores of Republican Senators and Representatives at 81.3. It is, in fact, below the score of ANY Republican legislator – the lowest is 60.6. Governor Jan Brewer is the lowest scoring Republican in the state’s legislative process. For additional information about the ratings, visit the Pachyderm Coalition website. Will Gov. Brewer Veto (More) Conservative Bills? AFP-Arizona’s 2011 Legislative Scorecard (the 27th annual scorecard put out by AFP-Arizona and the Arizona Federation of Taxpayers) will not be published until this summer, and will end up scoring hundreds of tax, budget, and regulatory bills. But with the close of the 2011 legislative session on Wednesday, we are issuing a preliminary report on how Governor Jan Brewer and the Arizona Legislature performed, based upon the bills having the largest projected fiscal impact on Arizona taxpayers, consumers, and producers. At this point, it is unclear how Governor Jan Brewer will perform on this year’s Scorecard. She will do poorly if she follows the bad advice of the Arizona Republic’s editorial board and vetoes the municipal managed competition reform (SB 1322), the interstate health insurance competition bill (SB 1593), and the statutory spending limit (HB 2707). Vetoes on those three bills would land her below 50 percent, in the category of “Friend of Big Government.” If she signs all three into law, she will score in the high 70-percent range (“Friend of the Taxpayer”). Please call and email Governor Brewer TODAY and ask her to sign those three bills. To contact Brewer’s policy staff, send emails to Page Gonzalez (pgonzalez@az.gov), Eileen Klein (eklein@az.gov), Michael Hunter (mhunter@az.gov), and Don Hughes (dhughes@az.gov). Transparency bills requiring local governments and school districts to post their budgets in prominent places on their websites. For Gov. Brewer and for the typical majority Legislator, the high base scores resulting from the votes enumerated above may be pushed slightly higher on the final Scorecard, given that AFP-Arizona has yet to grade hundreds of bills with low point totals. Legislators introduced dozens of good bills this session, and some of them made it to the Governor’s desk. (Of course, there were also many bad bills with low point totals, and we will likely discover some fiscal landmines among the dozens of bills that were passed quickly in the closing hours of the session). The constitutional Paycheck Protection referendum (SCR 1028) failed to move in the House, having been supplanted by a version of the reform (SB 1365) that included unprincipled (and voter-unfriendly) carve-outs and that failed to get the necessary forty “emergency” votes in the House to prevent the government-worker unions from taking the flawed version of the bill to the ballot. Use the link below to study AFP-Arizona’s scoring rubric (page 3), and to view hypothetical scores for Governor Brewer, the typical majority Senator, and the typical majority Representative (pages 4-6). For policy summaries of AFP-Arizona’s key bills, see pages 7-11. The AFP-Arizona Legislative Scorecard weights fiscal policy and regulatory bills according to their projected dollar impact to Arizona taxpayers, consumers, and producers ($1 million equals one point). The AFP-Arizona Scorecard does not grade bills relating to constitutional, electoral, moral/social, or criminal-law matters, except insofar as those bills are projected to have a clear and significant financial impact on taxpayers, consumers, and producers. Grassroots taxpayer activists and tea party members can help us greatly in promoting free markets by reminding Governor Jan Brewer and Arizona’s Legislators that we will hold them strictly accountable in 2011 and 2012. We hope that the AFP-Arizona Legislative Scorecard proves to be a very helpful tool for activists in demanding fiscal accountability from their elected officials. “Today I voted to take our troops out of the front lines of Washington’s political battles, cut more spending, and keep the government open. Senate Democrats have yet to support this or any budget resolution and our Commander and Chief has already said he will veto it without explanation. However, I will never compromise or stand down when it comes to supporting the men and women who put their lives on the line to protect us. “In addition to funding the troops through the end of FY2011, this stopgap measure will cut $12 billion more in Washington spending. At a time when our deficit is in the trillions and our government is on a verge of a shutdown, it is incomprehensible that Senate Democrats will not accept a modest budget cut that equals just two percent of this year’s budget. The House has passed two bills that would keep the government running through the end of this fiscal year and cut $61 billion in job destroying spending. (H.R. 1, passed February 19th and H.R. 1255, passed April 1st). H.R. 1363 is the third bill out of the House to fund the Department of Defense through the end of the fiscal year. 47 days after the House passed the first bill to keep the government running through FY2011, the Senate has yet to do the same. Many have been asking about my recent votes on five immigration related bills in the State Senate, due to circulated misinformation. Since misinformation does a disservice to you, my constituents and supporters, I am sending this email to insure that your news is accurate. I also believe that you are entitled to know of the careful reasoning I applied to these and to all my Senate votes. Emails and articles are circulating that I voted NO on all five bills. This is incorrect. The correct information is that I voted YES on three of the bills and no on only two. The two no votes were based on the best information available from a number of sources. In short, I sincerely believe that SB 1308 (interstate compacts; birth certificates) and SB 1309 (Arizona citizenship) are unconstitutional. If we as citizens believe in the U.S. Constitution and Federalism, we must then accept that the federal government operates under the enumerated powers found in Article I, Section 8 and under empowerment found in the Fourteenth Amendment. I hope you will read my complete rationale for the yes votes and the no votes by clicking here and opening my website. My website can be found at http://www.vote4frank.com – at the website simply scroll down to Frank’s Blog. There you will find a very thorough rationale on my votes. I believe that if you take the time to visit my website and read my account of the principle used to make these votes, you will see that my votes were thought out, followed the Constitution, and supported my constituents to the fullest. The Republican Precinct Committeemen (PCs) who elected me as their Maricopa County Chairman by an unprecedented margin of 70%, did so for a reason. They wanted a spokesman with a clear, consistent, conservative position on the issues as opposed to what they frequently heard from elected Republican office holders pandering to the moderate wing of the Party. The level of disgust held by PCs toward the Republicans who voted with the Democrats on the illegal immigration bills this past week is palpable. The PCs know better than to ask these maverick senators, “Where are your perfect bills or amendments that you have submitted to stop the illegal alien invasion?” There are no bills coming from these senators because they are mavericks and crossing the aisle to vote with the Democrats is what mavericks do. There are no Democrat mavericks because Democrats are committed to their platform and will not tolerate dissent within their ranks. The savvy PCs recognize the talking point excuses as insincere malarkey. They know the truth is that the business community demands cheap labor and the Democrats want the bonanza of the illegal alien vote upon attaining citizenship through amnesty. PCs are bewildered by Republican legislators whom they assisted in their quest for political power now voting against defending the party and the nation. As taxpaying citizens, the PCs see the results of the invasion. We have experienced a marked negative impact on our personal safety, while funding the overburdened educational, medical, and criminal justice systems dealing with the burdens imposed by those in our country in violation of our laws and national borders. Some of our schools now instruct children that the United States is an aggressor nation, teaching the racist LaRaza and Reconquista studies programs. Meanwhile, taxes and spending have drastically increased. We have imported a culture of corruption, intimidation and contempt for authority. Mob rule can be witnessed all too often at the Arizona State Capitol. Foreign drug cartels openly flaunt their power within our borders. Voter fraud and ID theft are rampant. The federal government will not stop this invasion. In fact, they have demonstrated that they will do what they can to insure that it continues. To persist with the mantra that it is a federal issue and will be addressed at that level is to deny history. The deterioration of all aspects of our society is manifested in the illegal alien invasion. PCs recognize that border security is national security. The refusal of these Republicans to take meaningful actions to secure our border in this era of Islamic terrorism is indefensible. Do these senators fail to realize the result their votes have on the well-being of the Party? Do they not remember what happened when Sens. McCain, Kyl and Rep. Flake advocated for an amnesty bill, while 80 – 90% of the Republican base opposed it? The GOP, thanks in large part to Tea Party activists who hold Constitutional and Republican Platform beliefs, is only now beginning to recover from the mass exodus to the Independent ranks provoked by our own representatives. Due to numerous liberal positions taken by some of our elected Republicans, the public sees little difference between Democrats and Republicans. That concept must change for Republicans to continue to succeed. But now the maverick Republicans in the Arizona Senate have dealt another body blow to the Republican base. It is imperative that newly invigorated activists not become discouraged because some Republican Senators have betrayed our efforts on their behalf and the confidence that has been placed in them. We can expect setbacks from time to time as the moneyed interests try to maintain their influence. Money can buy an election if the voters are uninformed or misinformed. It is our duty to build an educated voter base that understands the issues and votes accordingly, no matter how much is spent to deceive them. Our Founders put their lives on the line by signing the Declaration of Independence. 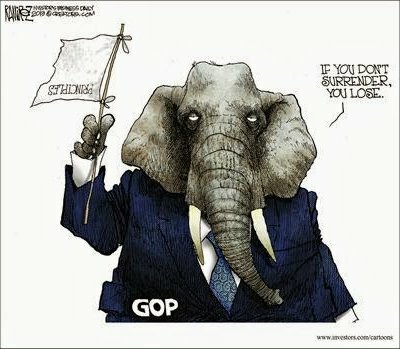 All we have to do is campaign in the Republican primary in favor of those advocating for the political principles vital to the survival of our Republic. I urge you to rally other patriots to the cause, join the Republican Party and make your voice more powerful by becoming a Precinct Committeeman (PC). Clearly, the Democrat Party will not advocate for your beliefs and becoming an Independent will only ensure Democrat victories. The most effective method of fighting is to become a Republican PC to help elect candidates who will represent our fundamental values. Please contact me at r_b_haney@yahoo.com if you have an interest in joining us, and I will explain how you can become involved in the political effort to protect Arizona and the United States.